Even if you're not old enough to have lived through the British Invasion in the '60s, the miracle of Youtube lets you see the teardrop-shaped Vox guitars and basses used by the Rolling Stones. And it's common knowledge that The Beatle used Vox AC-15 and AC-30, descendants of the first Vox amp, the short-lived AC2/30. In 1967 the Vox Cry Baby Wah-Wah made its first appearance and wasquickly thrust into the limelight byEric Clapton and Jimmy Hendrix. •	Stereo monitor speakers allow backstage tweaking, editing and rehearsing - no additional gear required! •	Full size VOX expression pedal provides stable pedal control during live performances. •	AUX IN is provided for jamming along to your favorite tunes via CD, MP3, etc. • USB port provides a single-cable audio connection to your computer’s digital recording software. 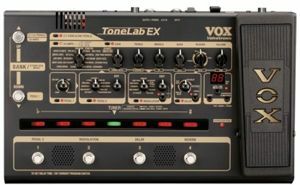 The Vox Tonelab EX also contains a 12AX7 triode vacuum tube to produce a warmer sound and separate itself from other multi-effect units. With 33 Amp models, 11 cabinet models, stand-alone drive pedals, 11 stand-alone pedal models, solid metal durable chassis, built-in monitor speakers, and a USB audio interface – it’s worth a look for $299.